A growing proportion of new enterprise applications and workloads are being deployed in the cloud, moving away from on-premise data centers. 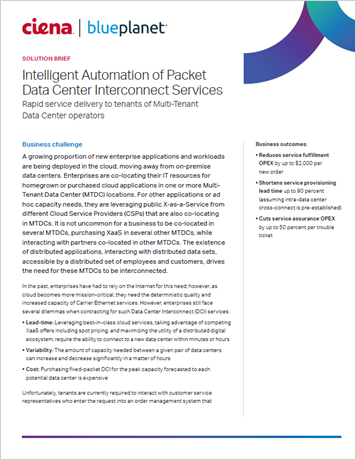 Enterprises are co-locating their IT resources for homegrown or purchased cloud applications in one or more Multi-Tenant Data Center (MTDC) locations. The existence of distributed applications, interacting with distributed data sets, accessible by a distributed set of employees and customers, drives the need for these MTDCs to be interconnected. By using Ciena’s Blue Planet Packet DCI solution, powered by the Blue Planet MDSO, service providers can intelligently automate operations and end-to-end service fulfillment across multi-vendor domains.